Title: THE SHILLING BOOK OF BEAUTY. 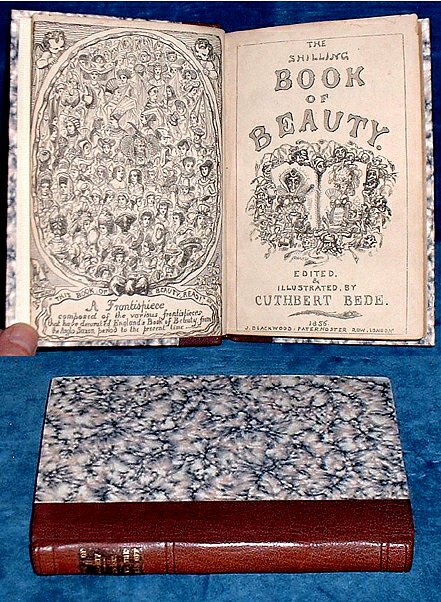 Edited and Illustrated by Cuthbert Bede, B.A. [Bound with] HUSES WITH THE FRONTS OFF by James Hain Friswell illustrated by William M'Connell. Description: London, James Blackwood 1856, 1855 Frontispiece & pictorial titlepage + many text illustrations, 2nd work with frontispiece & pictorial extra titlepage. . 2 BOOKS IN ONE VOLUME octavo morocco spined boards with original title laid on. Frontis + Pictorial Extra titlepage viii +127pp and (2nd work) Frontis +Engraved extra title +x +107pp. *Two Victorian humorous works from the same publisher nicely bound together.